Will BJP decision to give reservation to Upper Castes in Gujarat help the party or will it boomerang? Gujarat government has decided to provide 10% reservation to Upper Castes in the State. An ordinance is being brought to this effect. It is a decision, which may seriously affect the fortunes of the party in the long run. Has it been a decision taken after due consideration and thought? There are several questions. Is the party flaying with fire? Will the decision help the BJP or it will boomerang. Firstly, BJP was always seen as a part of Upper Castes, especially, Banias and Brahmins. 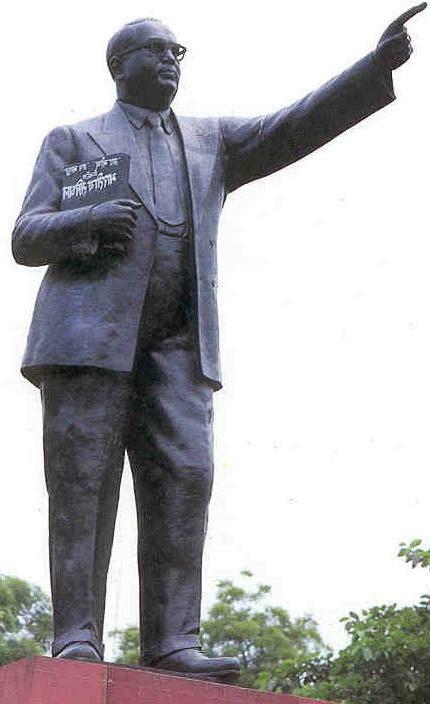 As it had to expand its base, it played Dalit card, Tribal card, as well as Backward card, and wooed them. But, its leaders, core cadre and supporters remain among the Upper Castes. Besides, RSS [Sangh] is mostly dominated by Upper Castes. Has the decision been taken to appease the Upper Castes? 1. Anandiben Patel government has taken a decision and the first thing is to be seen is that whether this decision will stand in the court. The Gujarat government spokesperson says that the government will stand by decision and will fight its case in the court[s]. 2. But, then, comes the crucial question. If Upper Castes or Economically Backward Classes [EBCs] among them get quotas in jobs [and education], will it not defeat the very purpose of reservations. Upper Castes have not been marginalised or exploited. 3. The Gujarat government says reservation [in jobs and in higher education] will be to all those whose annual income is Rs 6 lakh. Really! Those earning Rs 5 lakh per month are poor, in Gujarat government's view? That's quite strange. 4. Reservation was a constitutional measure to uplift status of Dalits and Tribals, the historically oppressed and disadvantaged people who were denied education, who were kept out of power, and who suffered untouchability and inequality of the worst kind. Upper Castes have been over-represented in government jobs. Hence, can it be called fair or it just a means to appease the forward castes and set right the situation in Gujarat, which witnessed Patel agitation. 5. The decision may anger the Backward-Dalit-Tribal supporters of the BJP. 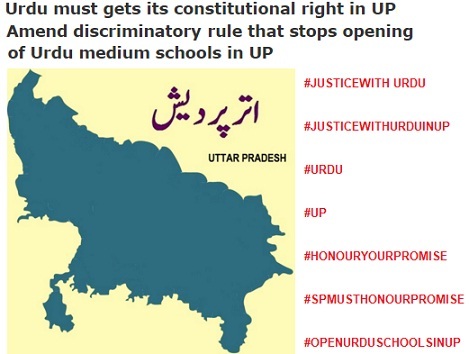 Uttar Pradesh is a crucial state. Samajwadi Party and Bahujan Samaj Party (BSP) may take the BJP to task over this 'reservation decision'. Already, RSS leaders' statements over reservation, cost BJP, an important state like Bihar. But the BJP must have weighed its options well. The BJP government has been facing the ire of Patidars [Patels] in Gujarat and had recently seen how Jats went on rampage in Haryana. Right now, the BJP has taken a decision in Gujarat, and it will take sometime before the picture gets clearer. No one can stop women from entering a Dargah. The Sufi shrines have always kept their doors open to everyone. 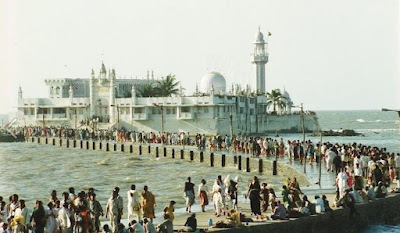 The decision of the Haji Ali dargah trust, a few years ago, to change the rules is unfortunate. They have barred the entry of women inside the Dargah, which is absolutely wrong. Women have visited Dargahs across the country, for centuries. It is true that when there is a big crowd of devotees, it is difficult to manage them. But, there are other ways, not by banning women's entry. In mosques too, women have every right to pray. But women can pray at home too. In big mosques like Jama Masjid, women are always around, sitting, praying. In Haj, Muslim men and women go together, perform all rituals and there is no restriction anywhere for women. In fact, there is no ban on women's entry anywhere and should not be. So who gives the authority to a Trust to impose such restrictions? Actvisit Trupti Desai's brigade has said that they would go inside the Dargah. They must be allowed to go and pay obeisance. The Bhumata Brigade had recently opposed a similar ban on women's entry in Shani Shingapur temple in Maharashtra. They got support from different quarters of the society. Similarly, the unreasonable ban must be revoked at the Dargah. This blog has been running for the last 15 years, and I rarely give social media tips. However, as it is becoming increasingly difficult for people to get new followers on Twitter, here is a method. There are many strategies that can be followed after you get your first hundred , 500 and 1000 followers. But how to get hundred or thousand followers? That's an intelligent way, not a hack, but a perfectly legal system. 1. You have a Twitter account and have barely 5, 20 and 50 followers in many months. You want more. 2. Go to the search box at the top, type the two letters as seen above 'follow back' and click on the search [lens sign]. Now there are various options, click on 'accounts'. 3. Chances are you will see 50-100 or even more accounts, most of them claiming that they 'follow back'. Just start following them in a go. It takes hardly 5-10 minutes. Now leave the place. 4. By the time you are back to yoour computer in an hour or six hours or 12 hours, most of them will have followed you back. Those who haven't, you can remind them, by a tweet, with @ as a prefix to the account. 5. As you follow back, more people will start following you. just follow everyone. 6. Once, this is over. Go to search again, type, 'I follow back', and search. Now you will get another 100-150 accounts. Repeat the process and follow all. Most of them will follow back. 7. Hope you have 150-250 followers by now. That's sizeable and respectable figure. If you don't need such random followers, you just stop, as you have reached a good figure. 8. But if you want to reach 500 or 1000 followers first, before going for a serious Twitter experience, go ahead, search 'always follow back' and follow all the accounts you find. 9. Your followers' number has risen staggeringly by now, hopefully, unless you are too unlucky. 10. Be imaginative, try similar words and combinations, you will see that your Twitter following has increased sharply, drastically and significantly. Yes. Say thank you, like this page or share, if you liked this information, which nobody told you, before. CONGRATULATIONS ON GETTING A LOT OF FOLLOWERS. *Later, when you want to purge, just check those who didn't follow, you can un-follow them. *The accounts that are useless or tweet nonsense or send obscene photos or irritating stuff, you can simply 'mute' them, so that they remain in the list as your followers but won't bother you. The day passed off quietly without a whimper. 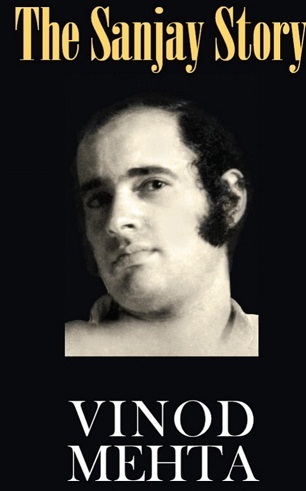 There were no tears, no protest, no recall of the tragedy or any demand for justice. 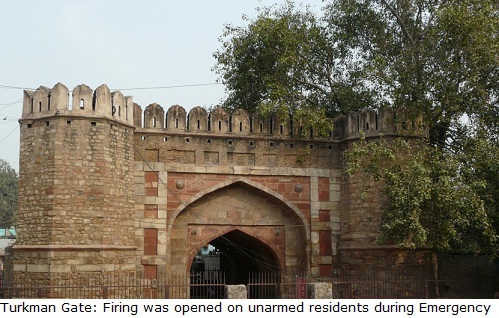 April 18 was the 40th anniversary of the Turkman gate killings--when poor Muslims of the area were shot dead, killed in cold blood during Emergency. The incident had occurred in Delhi, the national capital. As Sanjay Gandhi was calling the shots and there was tight control over newspapers, it was foreign media [BBC] that broke the news of the atrocities, blood and gore. 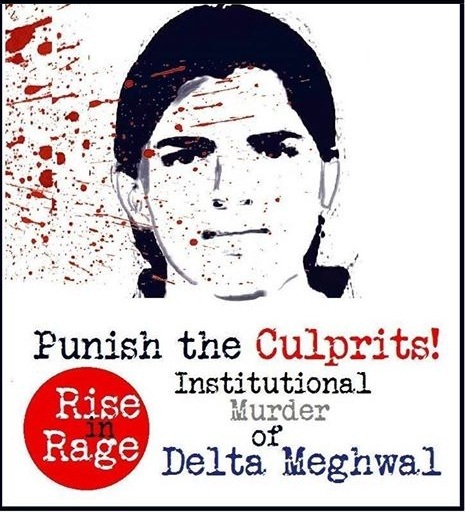 Yet, the massacre, one of the worst in the national capital in India's history, has been forgotten. What happened at Turkman gate was so horrific that even today one shudders while recalling (or writing about) the incident. The firing continued for long. And then all signs of blood and gore were also removed, as bulldozers decimated the entire slum--taking everything along. The ground was flattened. It was all over. This excerpt is from the book, 'The Sanjay Story'. It was written by Vinod Mehta. Many other writers have recalled the brutal attack on the residents of the locality. It was a Muslim-dominated locality and the DDA wanted the land cleared. Veteran Congress leader Subhadra Joshi had suggested locals to go for Gandhian protest. Hundreds of women and children with black bands, sat on the street. This was one of the incidents that caused immense anger among people. Muslims were naturally shocked, all over the country. The atrocities and the casual nature of the Congress leaders towards the killings, as if nothing had happened, angered them the most. It was the beginning of the Muslim disenchantment with the Congress. In fact, Turkman gate killings, hurt the Muslim psyche across the country, particularly, North India. After the incident, Muslims began looking for alternatives. The next election was, of course, won by Janata Party. But, in each state, Muslims were no longer going to vote for the Congress. In parliamentary elections too, the situation was same. With the sole exception of 1985, Muslims never voted for Congress, as a block, in the aftermath of Turkman gate killings. Grand conclave Simhastha 2016 begins at Ujjain: Why Ujjain Kumbh is known as Simhastha? Simhastha--the Kumbh at Ujjain, is all set to start on April 22. The Simhastha celebrations will continue for a month, ending on May 21. 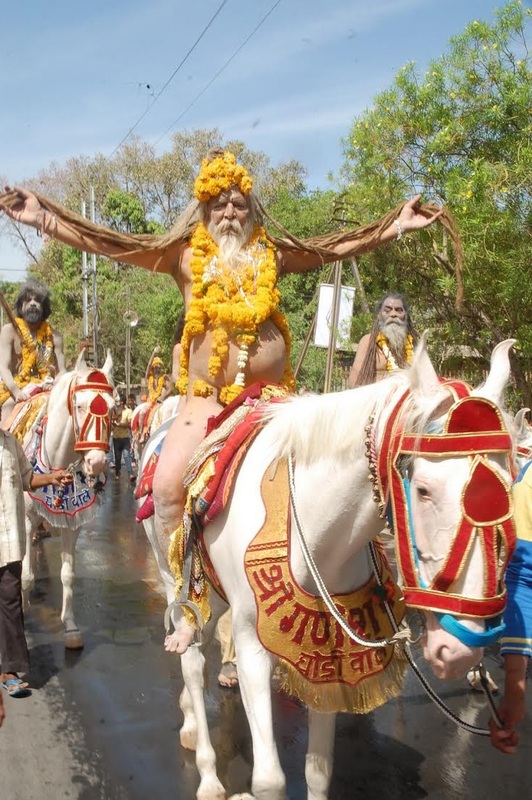 The grand conclave, which is considered one of the biggest gatherings on earth, takes place in Ujjain every 12 years. The Simhastha begins with the first 'Shahi Snan'. 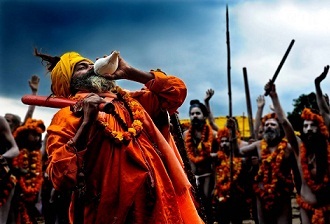 However, do you know why the Kumbh at Ujjain is known as Simhastha? It is because of Zodiac--the planetary configurations. Why is Ujjain Kumbh called Simhastha? Simhastha is celebrated when Jupiter enters the sun sign Leo's quarter or the Simha constellation of zodiac. Hence, the Ujjain Kumbh is known as Simhastha. Ujjain is the seat of Mahakal, the god who drinks liquor. Legend goes that nectar fell during the 'Samudra Manthan' or the churning of the ocean. In this churning, Gods and Demons were on different sides. The story goes like that the nectar (Amrit) from the urn (Kumbh) fell at four places on earth. These places were Hardwar, Prayag [Allahabad], Nasik and Ujjain. Periodically, the Kumbah is celebrated at these places, one after the other. Millions of devotees including Sadhus and pilgrims from all over the country, and even outside, have reached the town. Ram Navami was celebrated across the country yesterday. This is a photo of the procession. 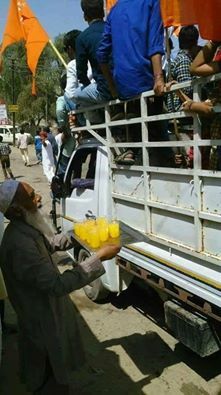 An elderly Muslim man is offering sherbet to those who are part of the Ramnavami procession. As friend, Jebroni sahab, writes, "India is not what you see on the Television channels". "Majority of the people live in harmony and celebrate each others' festivals". He is damn right. TV gives an impression as if there are troubled relations, an unending war, between religious communities and an unbridgeable gab, however, the reality is something different. Meanwhile, you can read the Nazm, 'Hai Ram ke wujood be HindostaaN ko naaz' that was written by legendary poet Iqbal, in praise of Lord Rama. Read the verse at this LINK. [Harmony exists all around us but is often ignored. Instead, stories of hate, discord and communalism get spread easily. There are a million examples in our daily lives across India but they don't get promoted, hence, news of hate and discord gets heard more. Let's change it, now. Why TV channels are against goodwill, confidence building measures between India-Pakistan that can help secure release of prisoners? 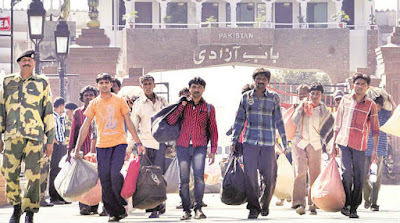 There are hundreds of Indians in Pakistani jails & similarly many Pakistanis lodged in Indian prisons. They include people who mistakenly walk to other side of border, those caught on suspicion of being spies, some caught for lack of proper documents, fishermen etc. Everyone should be able to understand the plight of the families who await the release of their kin. When 86 Indians in Pakistani jails were released last month, no TV channel [or even newspapers] bothered to show the news, prominently. This was just a few months after 40 prisoners were released from Karachi jail. Either it doesn't make good news or less TRP [who decides?] or because of the socio-economic background of the prisoners! If one prisoner dies in jail, there is outrage and war cries on TV (hundreds of Indians die in Indian prisoners every year, do we seen any outrage). But when dozens of prisoners are released, there is no live coverage of their coming to India or even welcome, their reaching their homes--something TV journos otherwise love most. If you see the condition of the families, you will feel the need for confidence building measures. Reports of Budh Ram and Jitendra Arjunwar's being lodged in Pakistan jail, led to former's release and latter's release is under process. But unlike print media, TV channels never focus on proper reporting that would bring the larger issue before the public and help society understand the problems. It just loves 'war-mongering' which helps none. It is saddening to say but one feels that Kripal Singh may have been alive, had media allowed India, Pakistan to come close to the table. While political parties--BJP and Congress must equally share the blame for raising the pitch, media has failed in its duty. I still remember in 203, 311 Indian fishermen were released by Pakistan, but the news was nowhere in our media, though internationally, it got wide coverage. Blacking out such stories is absolutely wrong and unethical. If such incidents are reported, there will be goodwill, people will also realise that something good is happening, the anger-hate level will come down. But perhaps, that's not the agenda. One sided picture is presented on TV channels, a situation where people just get to see the 'other' as enemy and in black. India too keeps releasing Pakistani prisoners off and on. Is it shown on Pak TV channels? I have no idea. However, the war-mongering for TRP takes us nowhere. It clouds the vision of the society. It makes us all dumber and it is an unethical act if media fails in its duty to inform, and rather goes misinforming us. This is extremely dangerous as it has reached a situation where people are shown just the negative, and any amount of goodwill measures just go meaningless. It isn't patriotic or nationalistic either. The number of deaths of prisoners in Indian jails is an astonishing figure, 1,700 deaths in the year 2014, mostly because of justice denied, delay in charge-sheet or trial & lack of medical facilities. With Simhasth--the Kumbh at Ujjain, round the corner, Muslims in Bhopal, are ready to host the Hindu brethren who are going to come here on way to attend the grand congregation. As many as 10 Muslim social organisations have joined hands to ensure facilities to pilgrims who reach the State capital. From arranging transport to free meals, the volunteers will also ensure other facilities at the Bus Stand and Railway station in Bhopal. Lakhs of people will come to Bhopal, on way to Ujjain. 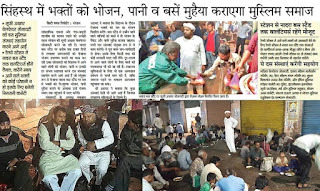 In fact, Muslim volunteers have been offering free meals to people at the Nadra Bus Stand in Bhopal, for almost three years. Maqbool Mansoori, who runs the free food programme, will lead the teams that will welcome, host visitors. Mansoori is known for his social work, especially, for running the 'langar' on his own, at the place for years. The good Samaritan had started it nearly three years ago. He saw plight of poor people from far away places who came to State capital for treatment of kin or for personal work and either ran out of money or fell on bad times due to a variety of reasons. Since then, he began the free meals programme. Initially, the people were sceptic that whether he would be able to run it. Now, it is considered one of the most successful such 'langars', and a unique one in Madhya Pradesh. The groups have decided that no government assistance will be sought, and they will provide free food packets to visitors. The transport arrangements will also be made. Volunteers will also ensure health facilities at the spot. This is second part of the #communalharmonyproject. The first part was 'Muslims take Hanuman flag to temple, hoist it'. 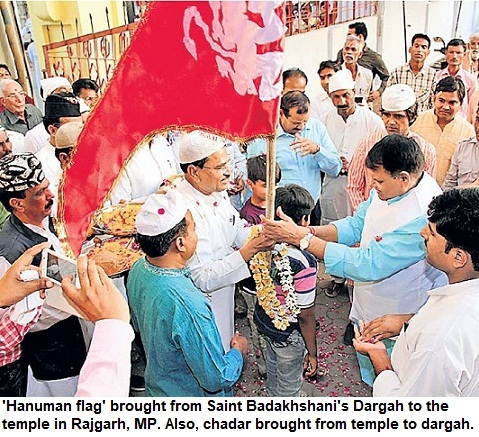 This has been an age-old tradition in Rajgarh--Muslims taking the flag of Lord Hanuman from the famous dargah to the temple on the occasion of Gudi Padwa. The 'Hanuman dhwaj' is taken from the Baba Badakhshani's dargah with fanfare every year. Also, in March, the 'chaadar' is brought from Ram-Janki temple to the Dargah during the Sufi saint's Urs. This year too, the 'flag' was taken out amid drum beats. On way, large number of citizens participated in the annual march. The 'Yatra' reaches Parayan mandir, where the people carrying the flag were welcomed. All the associated rituals were observed. The temple committee members take the flag. Subsequently, there is 'puja' and the Lord Hanuman flag is hoisted on the temple. The district administration also takes part in this ritual. "It was in 1979-80, when the tradition had begun. The socio-literary organisation Qalamkar Parishad had begun this tradition of taking the 'jhanda' from the Islamic shrine to the temple", said local residents. Now, hundreds of residents and officials of district administration attend it. When the flag was taken out on Thursday, district collector was also present, apart from other senior officers. The flag was hoisted at the summit of the temple. 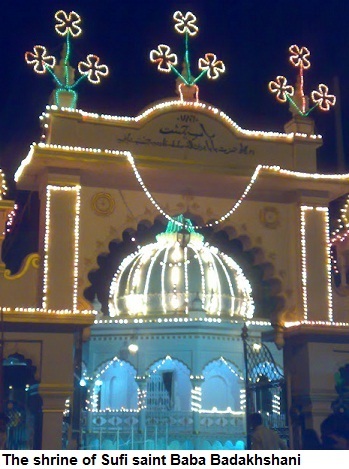 Baba Badakhshani's dargah is a symbol of communal harmony in Rajgarh and this tradition symbolises the syncretic culture of the region. Shahida Qureshi, Ramsingh Prahri, Jamil Ahmad, Raghunandan Sharma and Dinesh Nagar are amongst those who were the first to take out this flag. 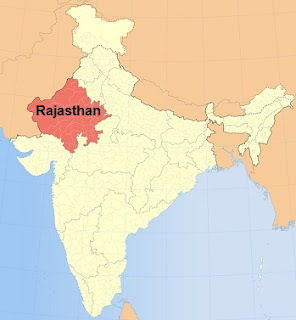 Rajgarh is a district adjoining Bhopal in Madhya Pradesh. Though it is quite close to Bhopa, it is also considered a part of Malwa region, as it is not far from Indore. As Mahbooba Mufti took oath as chief minister of Jammu and Kashmir, she made history. She is the first woman chief minister of the State. 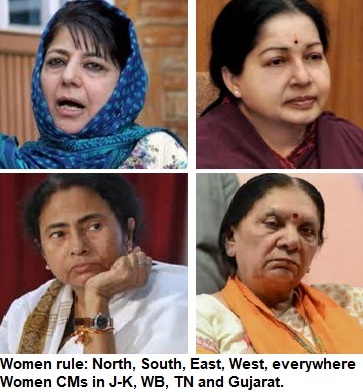 Now India has women chief ministers in important states located in all directions of the country. Just when I was about to write this post, a friend [journalist, blogger] tweeted the same line which I was about to write. That, 'Women leaders now rule four corners of the country'. That's quite interesting and the first such occasion when we see woman CMs in these states. In the North, it is Mahbooba Mufti, in the South J Jayalalitha in Tamil Nadu, Mamata Banerjee in West Bengal (in the Eastern part of India) and Anandi Ben Patel in the West [Gujarat]. Mamata Banerjee and J Jayalalitha have to face state elections soon. But for the time being, it is women power in states in the North, the South, the West and the East. Clearly, an important moment in history. The FIFTH is Vasundhara Raje, who rules another big state, Rajasthan. Another important factor is that three of these four women leaders have complete control over their parties. While Mahbooba leads PDP, a party that is in alliance with BJP, despite having a slight pro-separatist tilt, Jayalalitha heads AIADMK. Mamata Banerjee is credited for fighting against the Left in WB for long, and for making TMC emerge as a major party and for snatching power from Communists. Anandiben Patel is BJP leader who was given charge of Gujarat after Narendra Modi became Prime Minister. 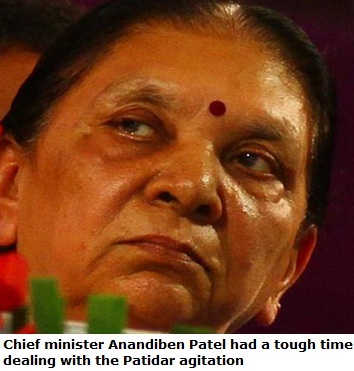 Anandiben Patel has faced Patel agitation and there is resentment against her within the BJP too. Jaya and Mamata are going to face elections, very soon. But for Mahbooba, it is going to be a challenge as to how she runs the government. It is a tightrope walk for her party, as there is nothing common between BJP and PDP when it comes to their political ideology. The PDP supremo has become CM after a long period of deadlock between her party and the BJP, after her father Mufti Mohammad Sayeed's death. But, for now, let's celebrate the women politicians' rise, their growing power, in India. One after the other, shocking incidents of crimes and atrocities on the Dalits are being reported from Rajasthan. The latest incident has occurred in Chittorgarh where three Dalit boys were stripped and beaten up publicly. The photographs are shocking and it is not proper to share them. Surprisingly, there has been no major action so far. The boys were suspected of stealing, but the minors were publicly stripped--it is nothing but total lawlessness--The Rule of the Jungle. This is the same district where Kashmiri students were arrested by police for no fault. There was a false allegation that they had cooked beef. It was finally proved that beef was not cooked at all. However, police said that they had to arrest the youths for 'their safety' from the right-wing elements on the campus. Doesn't it show that the Rajasthan police are subservient to the trouble-makers and the beef vigilantes. Innocents were made the accused? The murder of teenaged girl Delta Meghwal has also been a major case that shows the insensitivity of the administration. It is a clear case of institutional murder where the Jain college management is clearly at fault. The teenaged girl was sent to 'clean' a male instructor's room. She was later allegedly raped and then killed. The role of the authorities is questionable as for days no action was taken. A bandh call has been given in Barmer, in this regard. Isn't it Jungle-Raj in Rajasthan? In a historic visit, Prime Minister Narendra Modi has reached Saudi Arabia on a two day tour. This is his second visit to Gulf region, which has the highest number of Indian expats--many millions more than in US or Europe. The photograph on the left shows PM Modi amidst the Saudi leaders. This photograph shows him at the official reception in his honour held in Riyad. Flanked by the Sheikhs, Islamic flag with 'kalma' above and photographs of the former Arab leaders, Modi can be seen in the photo. 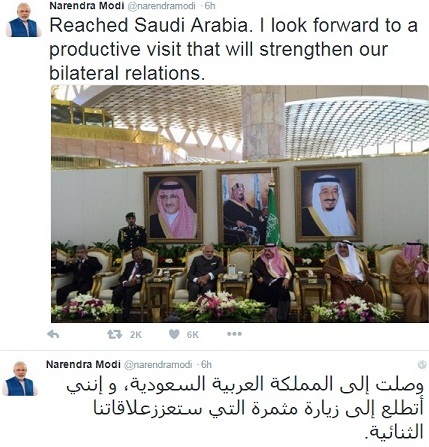 After reaching Saudi Arabia, Modi also tweeted in Arabic, from his official handle. Earlier, Prime Minister had gone to UAE, in a visit last year. The Indians living in Gulf send billions of foreign exchange to India. Saudi Arabia is an oil-rich state and is home to Mecca and Medina, the holiest sites in Islam, and hence, India has a special relationship with Saudi Arabia. Muslims number nearly 200 million in India, and constitute the second biggest majority after Hindus. Hence, the visit assumes significance. Interestingly, large number of BJP supporters have been targeting Saudi Arab, especially, on social media, but PM's visit indicates the importance of bilateral relationship between the two countries. 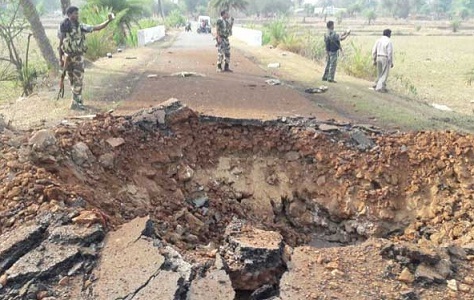 Seven policemen killed in Maoist attack in Chhattisgarh: Naxalism is not terrorism! In yet another attack on paramilitary forces, the Maoists killed seven personnel in Chhattisgarh. The attack took place in Dantewada in southern Chhattisgarh. The Central Reserve Police Force (CRPF) jawans were travelling in the truck when a landmine blast was engineered. The truck was blown to pieces in the blast. There was a big crater on the spot where the truck was blown up. The Maoists who were present, sprayed bullets on the CRPF personnel, and escaped with the weapons. Earlier, three CRPF personnel including two commands were killed in an attack earlier this month. That incident had occurred in Sukma district of Chhattisgarh. Apart from the three dead, 15 other personnel were injured. The CRPF's CoBRA commandos were patrolling the jungles when Naxalites fired at them. This incident had occurred on March 3rd. Clearly, Red Terror or Left-wing extremism remains a big challenge for India. However, the establishment and the media, doesn't seem to give much importance to killings in Chhattisgarh. 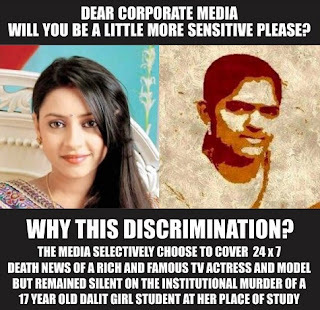 The coverage in newspapers and TV channels, clearly shows it. No mainstream paper carried the news as first lead on the front page. Maoist insurgency is not considered, terrorism. Is it because it is away from Urban India?